There are two kinds of people who can fly: the kind that are born with wings and the kind that gets a pair of wings and then learns to fly. Although I like stories about both, isn’t it sort of cool to read a story where basically anyone might in theory learn to fly? You, for example, if you happened to walk through the correct portal. 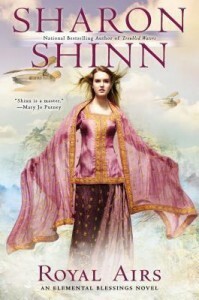 And I don’t mean like in an airplane, even in a world like the one in the Elemental Blessings series by Sharon Shinn. No fair if you need to become a test pilot in order to fly. Here are the SFF stories I can think of where people — basically ordinary people — learn to fly. 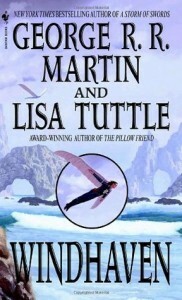 Windhaven by Lisa Tuttle and George RR Martin. I first read this ages ago, way before GRR Martin was famous, or at least way before I knew his name. I sort of liked it? Or to be more accurate, I liked the part about flying a lot and the part about gritty politics not so much. Blue Mars by Kim Stanley Robinson. I didn’t really care for the first book, Red Mars. I disliked most of the characters and reading about a failed rebellion, well, not really a lot of fun there. I liked Green Mars the best because I liked the main pov characters much better, the terraforming was all very fascinating, and a successful rebellion yields a far more appealing plot arc. But it’s Blue Mars where the technology for flight develops and is used. It’s not a major element of the book, don’t get me wrong, but it is one of my favorite bits. KSR is really good at description and I can close my eyes and visualize flight. The Green Sky trilogy by Zipha Keatley Snyder. These were so lovely. Not flawless, but I really enjoyed them when I was a kid. Also, the cover on Goodreads is pretty bad, but the original cover no doubt led me to pick this book up in the first place, because it is also lovely. Such beautiful images . . . giant trees, a gentle pastoral life, gliding . . . of course that isn’t quite flying, but close enough, close enough. The computer game for the Commodor 64 that was based on this trilogy was also deeply charming. First computer game I ever spent a significant amount of time playing. Still the one I think of wistfully. Too bad there doesn’t seem to be a modern version. 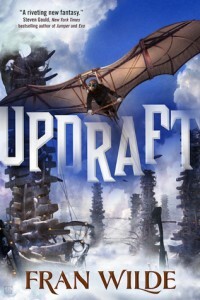 Updraft by Fran Wilde. From the cover, I guess this is a hang glider rather than wings? Someday I will read this and enjoy the flight involved, even if people don’t actually have wings. I never really thought about what other stories involving flight might have helped inspire this book. But, yeah, I’m pretty sure Winghaven and The Green Sky trilogy were in there somewhere. Stories where people can fly, or at least glide: got any I missed? Jane Yolen had one The Boy who had Wings – it’s a short in Tales of Wonder and probably other places. Zilpha Snyder’s Black and Blue Magic which I liked a LOT better than the Root trilogy wherein I could hear loud axe grinding. In B&BM Harry the clumsy kid is given a potion to pour on his shoulders and an incantation. He grows wings. They depart with another incantation. He has a great summer after all. I remember Penelope Farmer’s The Summer Birds making a huge impression on me, but I haven’t reread it in eons. Goodreads handily provides a summary: strange, magical boy approaches Charlotte and Emma Makepeace on their way to school one day, and offers to teach them to fly. Soon all of the children in the village have learned, and are given one precious summer of flight and freedom, although they must struggle to keep their outings secret. Those are all YA or MG I think. I tried the sample of Updraft and didn’t go farther. The Winter of the World trilogy’s (which I mentioned in older ones that deserve notice down page) 3rd volume the mage smith creates functional wings for himself and powers them by fire or sunlight. He’d been able to shapechange (with a now lost tool) and knew how wings worked, so designed the wings properly. The Teen just said ‘How did I forget The Girl who could Fly? by author forgotten. The Girl Who Could Fly by Victoria Forester, according to Google. And aren’t you both just a font of suggestion? I’m impressed. I read The Green Sky trilogy when I was too young to hear the axes grind; the books are shrouded in misty nostalgia. But I had forgotten Black and Blue Magic, which I also read and remember well, though I had forgotten it was by the same author! I have a sample of the first Winter of the World book, and I will look into The Summer Birds — wonderful title — and the others you mention. I sure hope I like Updraft better than you, since I have an actual full copy. Just as well you give it a thumb’s down; I don’t want to open it with far too high expectations. One of Douglas Adams’ books involved a character learning to fly. The trick was to throw yourself at the ground — and miss. Of course, the character could only keep flying for as long as he believed that he was able to do so. Once it occurred to him that it was against the laws of physics, he crashed. Wuxia movies often treat flight as a natural result of martial arts mastery. How about device-based flight? Do jetpacks or Legion of Super-Heroes flight rings count? Witches’ (and Harry Potter) broomsticks? Then there’s Heinlein’s “The Menace from Earth”– artificial wing-based flight, but only in limited recreational areas on the Moon. Raksura? All the main characters can fly, anyway. Oh, yeah, I remember the bit about throwing yourself at the ground and missing! That’s SO Douglas Adams. I don’t know, I think jetpacks are a lot like airplanes. I liked the flight in “The Menace from Earth” — I’d forgotten all about that. I bet there would be a lot of pressure to allowing flight all over the Moon habitats once people invented working wings. Yeah, Pete, but ordinary people can’t become Raksura, so I don’t think that counts. “Pressure” is an appropriate term– according to the story, it takes double the pressurization they use in most of the Moon to allow winged flight. I suspect between that and the larger tunnels needed, it would be a generational project to make it practical. 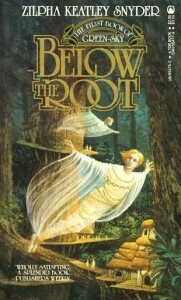 On the why-bother-with-wings front, Lifter was a paperback from years ago (1986, Amazon tells me: author is Crawford Kilian, never been reprinted) about a high school student who has enough flying dreams to work out the secret of telekinetic flight, and it eventually turns out he can teach the secret to other people. Oh, yeah, actually I really liked Lifter. Too bad it never got reprinted. Mike, I have to say, I’m dying to live in a world where towns become backwaters because you can’t fly to reach them! What a fun discussion! How about Tanith Lee’s Wolf Tower / the Claidi Journals? If I remember correctly (it’s been a long time, so maybe I don’t), there were rings that grant flight via magnets of some sort. Technology, but not precisely jetpacks. As a side note, Elaine T— thank you for mentioning The Dragon and the George! I read it in high school, and haven’t been able to recall the title since. It keeps nagging at me every now and then. I can finally put it to rest. 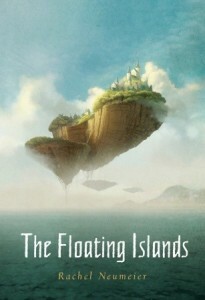 The series by Kylie Chan that you mentioned a while ago has a world where ordinary people can learn to fly, at least theoretically. A somewhat remote possibility, though and by the time they acquire the skill they’re not exactly ordinary anymore. The most recent book (#8) ends with the main character having just reached the point where she can do it and very interested in trying it out. This is not a recommendation, btw. The series held my interest through eight books so far, but there have been lots of times I seriously thought about stopping because of various issues with events in the books. Well, if *I* were learning to fly, I’d prefer not to have to take eight books to do it! “Human Levitation: A True History and How-To Manual” by Preston Dennett has accounts of people who have really flown ! Wow, Daniel, thanks for the pointers to all those stories!